As a professional office supply manufacturer in China, we are able to provide a variety of office supplies such as stapler, paper punch, paper cutter, pencil sharpener, etc. This is our desktop set, you can find other similar products of different functions by clicking the below icons. Welcome you to browse and choose! 1. Material: High quality ABS, PP (imported) and steel etc. 2. Features: Our desktop set is strictly conformed to national and industrial standards etc. 3. It is also safety for students to use our desktop set. 4. The beautiful desktop set will be a beautiful decoration of your office. Desktop set contains various office supplies to satisfy different needs. It includes bookbinding tools, hole punch and file keeper etc. It can high improve your work efficiency. 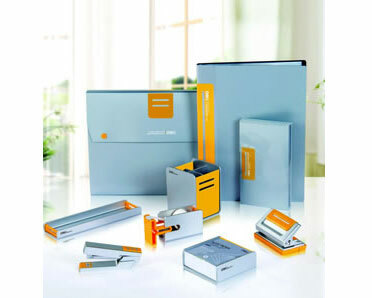 Deli, a professional stationery supplier, can provide you a wide range of office supplies. Welcome to choose our office products. » Desk Management System 1. Features: Absorbed advanced design philosophy form European countries. » Students Stationery Set 1. It contains several different student stationeries. 2. It is easy to carry and innocuity. 3. The packaging of the stationery set is popular among students.